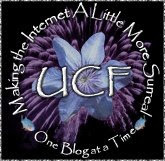 Polybloggimous: Stupid Weather Is Stupid. So here we are on Fauxgust 1, 2012 and it's 63 freakin' degrees here in Brooklyn. Which would normally be considered a really good thing. But there's just one problem. Y'see...Anon GF just finished making me this lovely red scarf made from the finest Yak yarn money can buy! Allow me to digress for a moment. Newt Gingrich should be totally in favor of the Yak yarn industry since, I'm told, the yarn only comes from the belly hair on the Yaks. 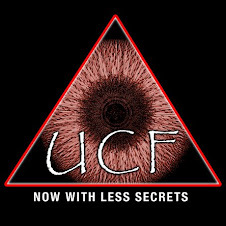 I don't know why that is, but it's what I'm told. Anyway, the perfect harvesters of Yak belly hair are, of course, dexterous little 5-year-olds. Can't ya just see the little urchins patiently brushing Yak bellies until they've harvested only the finest hair. And then getting just a wee bit stomped when the Yak gets bored and walks off. Ah well...plenty more 5-year-olds were that one came from. Anyway, it's not really scarf weather today, but when one has a brandy new red Yak yarn scarf, lovingly knitted by one's loving Anon GF, (anon to you -- I know who she is), one wears their brandy new red Yak yarn scarf...weather be damned. Ain't that a purdy scarf? Edited to add: GF thought you'd like to see some Yaks! Nathan, have I told you lately much very much I adore you? In a purely platonic, you maketh me to giggle, non-yak-inducing way? Okay, which photos were the ones of the yaks? Just kidding. And yes, weather be damned, if the Anon GF gives you something you must use it. That is an entirely wonderful scarf. 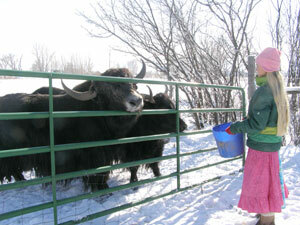 And of COURSE we want pictures of yaks to go with it. 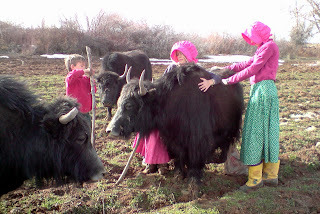 Can you ask her to make you a bonnet like the one the girls in the yak pictures are wearing? I shall not be receiving or wearing any bonnets. Yak yarn is delightful. It is a lovely scarf, and great to see that you still have your bench. I've been wondering when someone would recognize the bench! You mean your Teak Hat? Last year non-anonymous wife knitted hats and scarfs for all of our nieces and nephews out to the ends of the generations to include husbands, wives and significant other. I think it was 18 sets, not however of Yak yarn. I did wear mine last year, but it hasn't been cold enough this year. I don't wish to cast aspersions on your wife...and 18 items is impressive...but the Yak yarn really makes all the difference! Are you sure you're not Leon Redbone? That scarf would look even more marvelous paired with a linen suit and a panama hat.